Am I saying you should play them? Not at all. Am I saying you should think about playing them before dismissing them out of hand? Most definitely. Let’s get started, shall we? To be fair, Exiled Force isn’t necessarily “fringe” – it sees play in my own Gravekeeper’s deck and it shines in decks like Zoo. It’s a strong addition to the Warrior Toolbox and it can out a lot of problem cards. 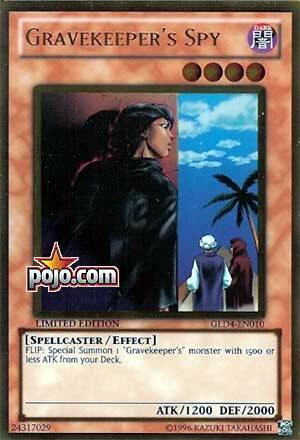 But its uses are certainly limited, in part because of its restriction to one copy per deck. And in Standard Goat Control, chances are there are other, better ways to get rid of problem monsters without sacrificing your normal summon for the turn. And that’s the biggest problem with Exiled Force – to use it, you have to normal summon it. It’s cool that it can tribute itself off with priority and thus avoid cards like Book of Moon and Trap Hole (another fringe card which we’ll cover in a later article). And it’s nice that you can use it a second and even a third time with Premature Burial and Call of the Haunted. But those cards are often put to better use reviving advantage generators like Airknight Parshath instead of a one-for-one card like Exiled Force. While it might not necessarily be a bad play to flip up Call of the Haunted and use Exiled Force to pop a Thousand-Eyes Restrict or a Black Luster Soldier, those are situational plays that Standard Goat usually is able to handle in other ways. Really, the card is best when included in the Warrior Toolbox. 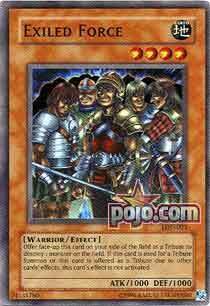 I’ve written about the Warrior Toolbox before, and in that article I discuss Exiled Force, its inclusion therein and which decks can use it best. I don’t personally think that Exiled Force is good in any deck not playing Reinforcement of the Army because at least with RotA you have the ability to search for Exiled Force and adding it to hand when you need it. But for any deck that doesn’t play Reinforcement, chances are it’s just too fringe for its inclusion. Back in 2005 it may have been a near-staple, but like Swords of Revealing Light, modern theory has put it on the back burner. I personally love Gravekeeper’s Spy – of course, I also love the Gravekeeper’s archetype as a whole, and I’ve worked hard to try to make it competitive in modern Goat Format. But we’re not talking about Spy in a Gravekeeper’s deck – where it’s a staple, of course – but rather its inclusion as a tech engine in other decks of the format. And really, when you’re playing Spy as a standalone engine to turbo out high-DEF monsters like a second Spy or a Gravekeeper’s Guard, I feel like the card loses a lot of its power. For one, it’s weak to Tribe-Infecting Virus, and unless you’re playing My Body as a Shield Tribe will just blow up any defensive wall Spy and Guard can mount. Not only that but the Spy engine takes up valuable card space in any deck it’s in aside from its own. And for what? Walling up can be a good tactic to use in the short term, but over the course of a duel it usually ends up not contributing much to your field presence or your card advantage. It’s nice to be able to just sit behind a high-DEF monster while you’re trying to draw your outs, and it can lock down a board to make it harder for your opponent to get to your LP. But while you’re drawing cards and getting your outs, your opponent is as well. Many smart players will simply let you draw cards and set your board up…while drawing their own outs themselves. Patient play is crucial when you’re facing the Spy engine and decent players understand how to get around a Spy wall. I think I have a bit of bias toward the Spy engine in general because it was popular in my local meta for a while, but it’s definitely fallen off. While it was a good tech and a surprising move back in 2005, today the card is seen by most players as more fringe than not. Man I love me some monarchs. I really do. 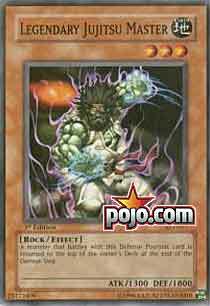 Mobius, Thestalos, Zaborg, they’re great tribute monsters that at least break even on summon. Mobius has a leg up on the rest because it’s the only monarch that can hit two of your opponent’s cards, thus going +1 instead of +0. I don’t know if I’d necessarily call Mobius fringe, but if it’s not it’s definitely close. Mobius is often seen in the side deck as a good out for Spell/Trap based Stall decks, Burn and Tsuk Lock. Its ability to pop continuous spells and traps makes him a solid counter to stall-based builds and it can bait out cards like Bottomless Trap Hole while still being able to pop another backrow. But it’s situational, and like all monarchs it’s super weak to Tsukuyomi thanks to its 1000 DEF. In this it’s even worse than Jinzo because at least Jinzo can stand up to Tsukuyomi and Exarion can’t pierce through it. But with Mobius both monsters can out it, which is a real problem. The main tribute that Standard Goat plays is Airknight Parshath and for a number of reasons that I don’t need to explain in this article. Any more and you start to run the risk of clogging your hand and being unable to summon it. Some players drop Airknight for monarchs, but substituting Airknight for Mobius is something that has to be done only after extensive theorycrafting and playtesting, and even then it’s rarely a good idea unless the deck warrants it. 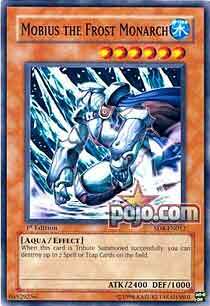 There are plenty of cards that Mobius can handle, but it doesn’t let you draw off damage and it doesn’t pierce and it doesn’t make it easier to summon Black Luster Soldier the way that Airknight does. But in the side, in a meta that you know has stall-based decks, Mobius is a solid choice. Otherwise, not so much. Ninja Grandmaster Sasuke is a card that I’ve always thought had potential, but the issue is its application. It’s like a Mystic Swordsman LV2 only it’s a LIGHT monster, and a 4-star, and it has 1800 ATK. Wait a minute, you say – it’s a better Mystic Swordsman LV2?! Why am I not playing it?! 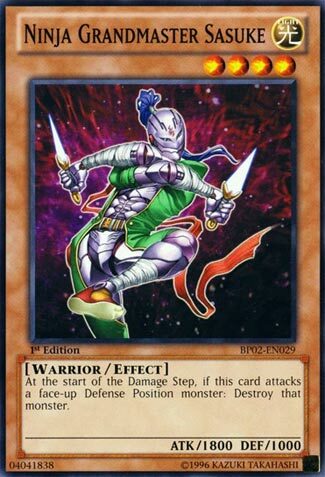 Well, the issue with Ninja Grandmaster is the fact that his destruction effect only applies to face-up defense position monsters, whereas Mystic Swordsman LV2 destroys face-down defense position monsters. So, Ninja Grandmaster can’t stop Magician of Faith or Magical Merchant or Morphing Jar or Dekoichi or any other flip effect the way that Mystic Swordsman can. I will say that Ninja Grandmaster is decidedly great against Spy walls, Guard walls, and any high-DEF monster in general. But because they have to be face-up in order to destroy them with his effect, it’s a card that you really can’t say is justifiable in a format that relies on face-down monsters instead of face-up ones. So he’s definitely fringe and for good reasons. He might be a good side deck card if you’re anticipating facing Gravekeeper’s, for instance, or other decks that pack high-DEF monsters, but he’s rarely good in the main and even in the side deck is decidedly fringe. Personally I really like Legendary Jujitsu Master. I don’t like him enough to try to build a deck around him, or to include him in most decks I play, because he’s definitely a fringe card, but he’s one of the more fun ones, to say the least. He’s got a pretty cool effect: if he’s in defense position and he’s attacked, the attacking monster gets put back on top of the deck at the end of the Damage Step. And his stats aren’t bad – 1300/1800 3-star EARTH Rock. But they aren’t great, either. You can’t really be aggressive with him, and he has to be in defense position to spin a monster back to the top of the deck. So you’re not attacking with him much. His best use is as stall, and usually if you’re playing Jujitsu Master you’re looking to catch tribute monsters so the opponent will be set back multiple turns. But most people don’t play it because it can’t be aggressive, so unless you have a followup play of your own after spinning a monster your play really isn’t worth much. It doesn’t help that he’s not searchable except via Giant Rat (which puts him in attack position, which you do not want) and that he’s an EARTH, which means he doesn’t help Chaos-oriented decks (the majority of decks in Goat Format are Chaos-oriented). These, combined with his inability to be aggressive, makes him a subpar choice in most decks. However, he has his uses, and in a stall-heavy deck it could be a good bait if you’re also packing Gravekeeper’s Spy and/or Guard. But even if a player isn’t anticipating hitting Jujitsu Master, and you do end up setting them back multiple turns, the real question is how you’re going to follow up. Most people would rather just make more conventional plays that are guaranteed to do something positive as opposed to a roguish tech card that may or may not pay off. That’s it for this time. As always, check out the Pojo Goat Format Thread for the latest Goat Format discussion, and e-mail me anytime at anteausonyugioh@gmail.com. There’s also a Discord server for Goat Format that you can check out, too. Previous articleDeadeye Plunderers – Pirate Week. Our 4,000th MTG COTD!